Good morning! Welcome to The Morning Shift, your roundup of the auto news you crave, all in one place every weekday morning. Here are the important stories you need to know as you head out into the wilderness of our ongoing international nightmare. U.S. proposals that are causing anxiety for Canada, Mexico and much of the business community would significantly raise regional content requirements for autos and auto parts, with a separate requirement for domestic U.S. content; eliminate a dispute settlement mechanism for unfair trade practices; limit Canadian and Mexican companies’ ability to bid for U.S. government contracts; and institute a sunset provision that would subject the agreement to a renewal process every five years. In a separate briefing, Mexican Economy Secretary Ildefonso Guajardo said, “It is a waste of time trying to design policy tools that will try to move 1,000 jobs from here to there.” All sides would be better off creating a system that addresses how automation will change the workforce of the future, he said. 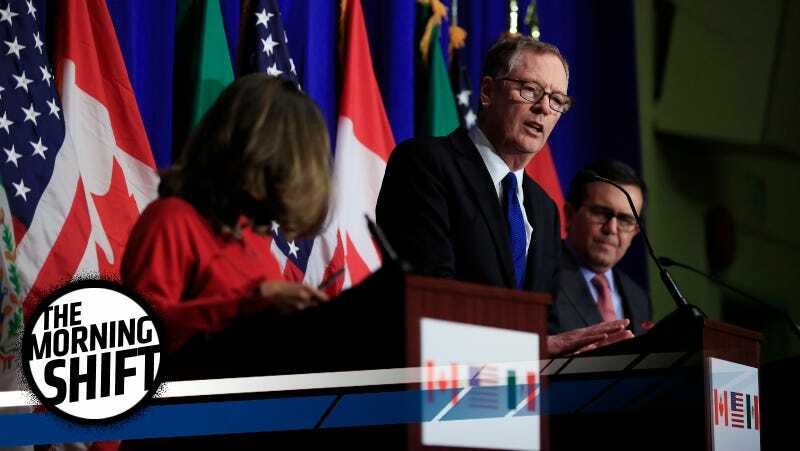 Meanwhile, U.S. trade representative and poster boy for protectionism Robert Lighthizer continues to point his fingers back at Mexico and Canada for being unwilling to address trade deficits. He even accused Mexico and Canada of rejecting proposals they already agreed to in the Trans-Pacific Partnership agreement. Yet focusing on deficits only tells part of the story, according to Canadian Foreign Affairs Minister Chrystia Freeland. She argued that the United States enjoys $634 billion in two-way annual trade with Canada, despite the $8 billion trade surplus and $36 billion manufacturing surplus with the country. She argues that the U.S. would be shooting itself in its own foot to withdraw from NAFTA. There is such an impasse between the members that they announced that these talks will have to go into 2018 now. They originally (and perhaps too optimistically) wanted to end in 2017 to avoid any conflicts with elections in Mexico and the U.S.
It’s all very scary news for the auto industry, as studies estimate that up to 50,000 auto supplier jobs would be lost if the U.S. leaves. General Motors president Dan Ammann believes they have all the components in place to start testing autonomous taxis in two to three years after their latest acquisition of LIDAR firm Strobe, reports Reuters. Since buying San Francisco self-driving car startup Cruise GM last year for a price that could total about $1 billion, GM has accelerated efforts to build both autonomous driving software and mass produce electric cars that can pilot themselves. GM has indicated that it could start testing robot taxi services within two to three years. GM wants to build a large autonomous fleet, but wants to keep it all in-house. Ammann rejected rumors that they could spin off car-sharing app Maven or their autonomous business, arguing that it’s easier for them to have everything under their control. The decision was not taken as a result of U.S. President Donald Trump’s more confrontational policy towards Tehran, a spokesman for the company said. “The reason is that at this moment Seat needs to concentrate its efforts on those largest European markets where it still has major growth potential such as Italy or France, and in regions such as Northern Africa or Latin America,” the spokesman said. Seat has been growing immensely, making a profit for the first time in a decade last year and opening its first production facility outside Europe this year. They were the only Volkswagen Group brand to post double-digit growth in European sales this year, as the Dieselgate scandal rocked much of the rest of the company. The Spanish government had invited Seat to look into potential opportunities in Iran, Seat’s chief executive told Reuters. However, they’re staying out for now. Electric cars are booming in China, and BAIC Group chairman Xu Heyi says they’re on target to exceed government targets by a long shot. Chinese companies could produce up to 1 million electric cars next year, and 3 million by 2020. “The trend is definite,” Xu told reporters on the sidelines of the ongoing Communist Party Congress. “Rather than the time when gasoline-fuelled cars are withdrawn, it is more important to consider the extent to which new energy vehicles are popularized, or their market share,” Xu said. China’s targets were initially to hit 2 million electric cars per year by 2020, and 7 million per year by 2025. China is already considering a ban on the production and sale of petrol and diesel powered cars. All of China’s cars could be electrified in some way as soon as 2030, BYD chairman Wang Chuanfu told Reuters. Pour one out for expensive writing instruments, y’all. Embattled former Fiat Chrysler executive Alphons Iacobelli has lost another overpriced luxury pen. Iacobelli was accused by federal prosecutors of buying luxury goods with money siphoned off from a United Auto Workers training program. The feds just seized $354,000 in funds and $37,500 in luxury pens to help offset financial harm caused by the scam, reports The Detroit News. Prosecutors believe Iacobelli spent over $1 million on union funds on various luxury goods including not only pens, but a Ferrari with “IACOBLI” personal plates. The source described Iacobelli’s neighbor as a VIP Montblanc client who first told Iacobelli about the special edition Lincoln pen. Iacobelli gave his neighbor the pen as an apparent gift, the source said. Surprise, your neighbor was in a massive corruption scandal and we’re going to need that back! Neutral: Would You Ride In One Of GM’s Test Cars? General Motors may want to test out a fleet of self-driving taxis in just a couple years, but would you personally want to try them out out?